With its sun-kissed beaches, clear blue waters and great-value hotels and resorts, it’s little wonder that growing numbers of Britons are looking beyond Spain and France and instead booking summer holidays to Turkey. In particular, the Aegean Coast has swiftly established itself as a major summer destination, with its beaches on a par with anywhere else in Europe and its friendly hospitality second to none. However, this stretch of Turkish coastline offers visitors much more than the chance to top up their tans without breaking the bank. Located just a short distance from major resorts such as Antalya and Marmaris are a wealth of architectural and historical gems, many dating back thousands of years. As well as numerous picturesque towns, the region is home to countless natural wonders. Here are just a few reasons for leaving the sun lounger behind for just one day. 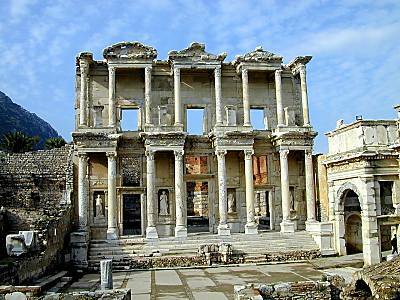 One of 12 cities that made up the Ionian League during the Classical Greek era, Ephesus reached its peak under the Romans, emerging as the region’s economic and cultural powerhouse. And, even though only ruins remain, it’s still possible to gain an appreciation of the city’s former glories. Highlights of the ancient city include the Celsus Library, which was built by Julius Aquila back in the year 110AD, the Terrace Houses that were once home to the ruling elites and the magnificent Ephesus Theatre. It’s also home to a large gladiators’ graveyard and several top souvenir shops. The ruins are located just two miles outside of the town of Selcuk, an easy day trip from many of Turkey’s most popular resorts. Situated on the southern tip of the Aegean Coast, the city of Bodrum offers a perfect mix of old and new. These days, it’s best known for its bustling harbour, a popular stop-off point for yachts, as well as for its vibrant nightlife. Away from the noise of downtown Bodrum, you can take in the ruins of the old Mausoleum – one of the original Seven Wonders of the World – as well as stroll through what remains of the Castle of St Peter. Although Bodrum’s beaches are nothing special, the town is just a few miles from some of the most beautiful parts of Turkey’s coastline, while there are also regular shuttle services to nearby holiday resorts and major hotels. A popular day trip from the resort of Antalya, Pamukkale is Turkey’s top mineral bath spa. Pamukkale, which is set in beautiful natural surrounds, has been welcoming visitors since the Romans first discovered the benefits of its warm spring waters. While it may get crowded over the summer months, a trip to Pamukkale still offers the chance to unwind while mixing with the locals. Another seaside town that’s been a tourist hotspot since ancient times is Foca. Stretching across two picturesque natural harbours, this laid-back town is now a popular draw for windsurfers, while those looking for a more relaxed break can take pleasure cruises up and down the coastline. As well as the impressive ruins of two small fortresses, Foca is well-known for its outdoor dining under the stars, with fine wine and freshly-caught fish both on the menu.